SOS - Save our ship! This is the third belated attempt to keep all those who have sailed aboard the 'Eye of the Wind' informed of where she is going, where she has been, what is planned for her and general news etc. 1986 has been quite a year for the ship - for those who have been out of touch, 'Eye of the Wind' played "Hollywood" again to feature in her third film "Taipan"; made in China by the De Laurentiis company. It was a $ 30 million epic that has Australian actor Bryan Brown in the lead, and most of the ship's crew as extras. By going to China, the ship is one of the first non-commercial vessels to enter that country since the war - a little bit of trivia for those interested. 'Eye of the Wind' has left her wake in new oceans in her world travels. After a season in 1985 around the Pacific Islands, she sailed into Cairns and then made a voyage to Hong Kong, Macau and China via Palau. To set the record straight, contrary to what you may read in articles, brochures and newspapers, 'Eye of the Wind' is not involved in the First Fleet Reenactment. Adventure Under Sail has been disassociated with that organisation for some three months or so. Unfortunately, it was a disappointment not to return to England and participate in the voyage, but owing to the First Fleet Company not meeting its obligations, we were forced to pull out of the venture. 'Eye of the Wind' has feateured in a few magazines recently, if anyone is interested. "Club Marine", "Cruising Helmsman" and Neville Coleman's diving magazine. Thanks to all those people who submitted the articles and some splendid pictures of the ship. The publicity helps to keep the old girl supplied with adventurers and divers, and adding new people to the already enormous family of voyagers. Whilst on the subject of Perth, our ex Skipper of 2 voyages to Australia, Richard Grono, has moved to Perth with his wife Monika and son Andrew, to take on the position of Captain on board "Leewin" the new West Australian built sail training barquentine. Hopefully 'Leewin' and 'Eye of the Wind' may sail together while we are in Fremantle. Since "Taipan" 'Eye of the Wind' has had some new improvements. The rope covered poop deck railing has been replaced with bronze stanchions and a splendid wooden capping rail, which enhanced the sheer line. Tan sails have been bent on to replace the white which we have always had. The tan sails are from the "Taipan" movie, and were used to change the ship's appearance because of her dual role as 'White Witch' and 'Morning Cloud'. Tiger nas wanted tan sails for the 'Eye of the Wind' for some years now; 10 in fact so that's one achievement anyway. What a grand sight the ship looks under full sail. For all those with heaps of white sail photographs, a new crop can again be taken. After Perth 'Eye of the Wind' will sail across the Great Australian Bight to make her 4th visit to Tasmania. A number of passages to the South West (Port Davey Bathurst Harbour) will be undertaken, along with visits to the east coast (Port Arthur, Maria Island and Wineglass Bay). One dive cruise is also planned, and if there is enough response, an ornithological cruise is planned. After visiting Tasmania, the ship will return to Sydney, then out to its old sailing grounds around the South Western Pacific. As one can see by the '87 schedule 'Eye of the Wind' will be going to Hobart to join the large fleet of sailing ships which will participate in the grand sail to Sydney for the Bicentennial. Anyone interested in that phase from Hobart to Botany Bay, Sydney should book early since we are sure quite a few peope will be interested. If bookings are heavy, we will consider a ballot selection for the berths to ensure a fair chance for all. We hope you approve...so good luck. Officially we cannot be in the race, since the rules require a compliment of young people (two thirds to be exact) under the age of 24, to be aboard. We would prefer to have old sailing friends and give them the opportunity of experiencing the pageantry of the occasion. An almost new crew has replaced the old familiar faces in Cairns. (...) were Wayne Chimenti and Bryce Bathe, a couple of (...) regulars' aboard the ship. Also Dan Parrot, an ex-shipmate (...) ayne's from the ill-fated 'Pride of Baltimore'. Anne (...), who was an extra from the "Taipan" film set - she sailed to Australia as one of the 'galley slaves'. Ted Addicot, the engineer, who was the last person to leave the sinking 'Southern Quest' in the Antartic ice pack. Pauline Wright returned to Britain after a 12 month stay on the ship. Jan Pope has resumed her career in Hobart. Young Rick Officer is the sole remaining member of the 'Toad Hall' set. Sally Drury rejoined the 'galley girls' along with Debbie Heydon and 2 new slaves. Joe Spinelli also joined us in Cairns - he is back in his old haunt in the paint locker. Peter 'P.K.' Kane took over as engineer. 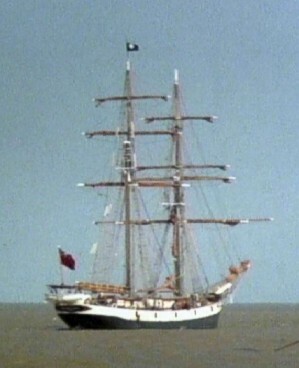 Peter spent time aboard 'Bounty', during the filming of "The Bounty" and met 'Eye of the Wind' when her masts were used as props during a film sequence in Moorea. Jonathon Hickling has joined us after a 19 month stint aboard 'Sea Cloud'. Len Garrard has been a pleasure to have aboard once again, along with Richard Gray, Jeanne James, Wilga Kottek, Charles Copeland, Pam & Geoff Layton and Fionna Douglas. Lynne Davies joined us in Cape York for a sail to Thursday Island. Lynne is working for the wilderness lodge, and is planning to go ice-climbing in New Zealand. After the saga of the 'Southern Quest', Lynne went back to Tasmania and featured in a documentary film, then cannoed from Cairns to T.I. and cycled back to Cairns ... certainly a busy year for Lynne! Ex-galley girl Kate Edwards flew out to Vancouver to join 'Bounty'. She joined the mass exodus of their crew after only 3 days, and went to the east coast to work aboard a number of sailing ships. Phil "Jungle" Long is acting the Scarlet Pimpernel somewhere around Sydney....come out where ever you are! Noel Kelly sailed on 'Tucker Thompson' in New Zealand, and then joined the 'Christian Radich' for the Statue of Liberty festivities this year. Steve Glenn, rumours have said, has swallowed the anchor and returned to his electronics career....can this be true? Tim Morris, after leaving the ship in Vila, is having a long land rest at home with his Parents. Paul Hill departed the ship in Hong Kong and is now dive master / mate on a vessel out of Devon doing dives in the Scilly Isles. Marriage News ... the bells are ringing for Fred Christie again - to an old childhood sweetheart. After skippering tankers out of Fiji and Singapore, Fred will soon be residing in Toorak. Good luck to Fred and his future wife. Anyone like to commission paintings of the ship? The lower saloon has 2 new supber paintings by Peter 'Spider' Andersson, who spent 2 1/2 years as Mate on the ship from the Mediteranean phase to the end of Operation Drake. A return to Pitcalm Island in 1989 for their Bi-Centennial. We know quite a few people are already interested So far no definite details have been drawn up ... as soon as they are we will let you know. If you have any information, ideas, poems etc, anything we can use in the newsletter, please write to any of the owners - we would be glad to hear of any. In closing, thanks to you all for your continued support and loyalty.